Many years ago a client stopped to chat with us at the end of a leadership program for his company. “You know,” he shared, “What you offer here is the soft stuff. It’s simple, but it’s not easy.” I’ve been repeating his words for years, as I’ve never heard anyone capture it better. 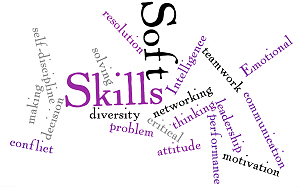 The soft skills may be “soft” – whatever that means – but they aren’t easy. It can be difficult to change our behavior after years of doing it a different way. It takes time to think through not just what we’ll do on the job, but how we’ll do it. But it’s becoming more and more important to do so. A recent study by Millennial Branding, a consulting firm in Boston, found that although hard skills such as financial acumen, strategy, and software knowledge can get you through the door when you’re looking for a job, in order to succeed, and to get promoted, you also need to develop your soft skills – skills like being a good listener and communicator, and knowing (and appropriately sharing) your strengths and development areas. In fact, as shared in this post at wsj.com, ‘Soft Skills’ Can Help You Get Ahead, the ability to self-assess your strengths and weaknesses, and then the determination and ability to act on this knowledge, can make the difference between getting a promotion or not, between success and failure. Be aware of your own perspective – take the time to know that you’re most likely coming to discussions with preconceived notions and ideas, and take the time to determine what those are (and how true they might be). Be open to the perspectives of others – again, push against your set ideas of what is ‘right’ and ‘wrong’ and be open to others ideas, needs, and perceptions. Find the most annoying behavior you do and begin to stop it – are you always late? Do you interrupt? Do you glance (or stare) at your device during conversations? Do you never shut-up in meetings? Do you never speak up? Find the most obvious flaw in how you’re currently interacting with others and stop it. Listen – really listen. Don’t listen for the break so that you can jump in. Don’t listen for the reasons someone else is wrong. Do your best to completely hear their point-of-view, and make sure they feel like you heard them. These simple steps can enhance your ‘soft skills’ which can only fortify your hard skills. Take the time to focus on your behaviors and interactions with others – and reap the benefits. What is your biggest soft skill challenge and how have you overcome it? For support in focusing on your ‘soft skills’, contact Lisa at lkohn@chatsworthconsulting.com. Click here to purchase The Power of Thoughtful Leadership: 101 Minutes To Being the Leader You Want To Be. I wholeheartedly agree with your post. There is a tendency to believe that if something cannot be quantified, it does not exist. What does that say about empowering your workforce, creating an environment that encourages risk, eliminating waste, communicating in an open and honest manner, building trust among employees, working hard to develop an impeccable reputation, and unifying your organization around a mission and shared values. I believe that, although you may not find these intangible factors on a balance sheet, they separate excellence from the also-ran. Thank you, Frank. Well said! It is so true that the intangibles, the qualitative factors are what lead organizations to excellence. Thank you again for sharing your thoughts. Thanks for this article. Soft skills are what highly evolved people hone. They have matured (think of Kohlberg’s stages of moral development), understand that reciprocity is a winning move, and truly appreciate and care for people (probably come from a loving home). It excites me to see current leadership training and models helping people to achieve the goals you outline in this article vs how to manipulate their workers, staff, etc. and even customers. Thanks Kelly. We like that – “Soft skills are what highly evolved people hone.” Thanks for sharing your thoughts and expertise.